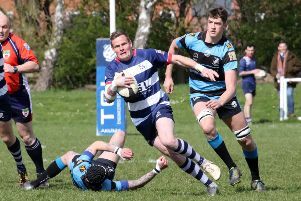 After seeing Banbury Bulls lose their first Wadworth 6X South West One East outing in 22 games, head coach Matt Goode must pick his players up to face early leaders Newbury Blues. So can his side put the brakes on the early leaders? After winning their last 21 games in the league the Bulls slipped to a 21-12 defeat at Marlborough. Despite being new to the league, Marlborough showed they meant business. Winning their first three games of the season against Swindon, Trowbridge and Wimborne. Marlborough have recruited several Pacific Islanders which has added a real flair to their play and they now have the ability to score from almost anywhere. It was a disappointing loss in toughs conditions that will sting for a while but the application was there for the full 80 minutes. Marlborough were clinical when they had the ball and without it they were uncompromising as Kallum Dixey and Jack Briggs both picked up injuries. Goode said: “We didn’t really get the rub of the green. “They were clinical with some of there chances, one try looked like a forward pass, the second was a bit of a fluke but that’s how it goes. I’m proud of the boys though, we won 57-13 last week but I was a bit disappointed with some of the performances.